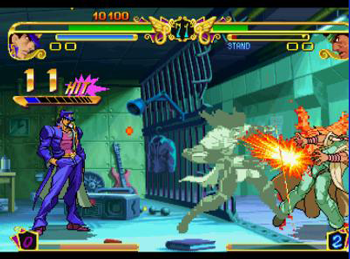 Delightfully weird fighting game, Jojo's Bizarre Adventure may be getting a HD makeover. Xbox360achievements.org lists a total of 12 achievements for Jojo's Bizarre Adventure HD for XBLA. If the site's information is correct, the title is set for release on XBLA and is being produced by CyberConnect2, the developer responsible for Asura's Wrath and the upcoming Jojo's Bizarre Adventure: All Star Battle. Despite being known mainly for the goofy "WRYYYYYYYY" meme inspired by one of its weirder super moves, Capcom's Jojo's Bizarre Adventure - one of the few video game adaptations of the long running series to make it to the West - has a notable cult following. A new anime series and 3D fighting game based on the series were announced last week, which means the HD re-release is probably there to ease gamers back into the series, much like Bionic Commando Rearmed and Street Fighter II HD Remix did for their respective franchises.